This article first appeared in Artibus Asiae, vol. 36. no. 3 (1974), pp. 169-218; it was re-printed in Mary Shepherd Slusser, Art and Culture of Nepal: Selected Papers, Kathmandu, Mandala Book Point, (2005), pp 429-504. Asianart.com is pleased to republish this important early article as part of the documentation on the damage inflicted by the earthquakes of April and May 2015, the first of which totally destroyed Kāṣṭhamaṇḍapa. Please also see the article by Dipesh Risal published on Sept. 13, 2015, Kasthamandap: Microcosm of Kathmandu's Living Culture and Storied History. Another important article by Mary Slusser on this important and now lost structure will be published soon. Among the imposing concourse of Nepalese temples there are two anomalous ones, the Kāṣṭhamaṇḍapa at Kathmandu and the Dattātreya at Bhaktapur. Although both primarily now serve religious functions and are considered to be temples, both buildings were originally sattals, a type of dharmaśālā, or free public rest house. As two of the oldest extant buildings in the Kathmandu Valley, the traditional seat of the capital and the cultural center of Nepal, these two structures deserve special study. It is to Kāṣṭhamaṇḍapa and Dattātreya, then, and to the more modest structures to which they relate, that this paper is devoted. The dharmaśālā is an ubiquitous feature of the countryside and townscapes of the Kathmandu Valley. Normally less imposing than the more famous "pagoda" temples, the free public shelters are equally characteristic of Nepalese architecture and in fact outnumber the temples. Morphologically, dharmaśālā and temple are closely related, each representing functionally differentiated aspects of the architecture of the Newars. The Newars, while in fact an ancient ethnic amalgam, generally may be considered as the indigenous occupants of the Kathmandu Valley and its contiguous regions. Legendary dynasties apart, the Newars seem to have been first organized into a viable political entity by the Licchavis (ca. A.D. 300-850), and following their decline, again by the Mallas in A.D. 1200. The Malla kingdom endured until 1482 when it began to dissolve into a number of still more petty "kingdoms," or city-states, the most important of which were Kathmandu, Patan, and Bhaktapur. Conquered in A.D. 1768/69 by the Śāha dynasty (perhaps of Rājput descent) from its mountain seat of Gorkhā, west of the Valley, the three Newar states were joined with numerous equally petty hill states to forge the modern nation of Nepal. Traditionally, the Newars, merchants, craftsmen, and farmers, are by preference town dwellers. Communally oriented, they crowd together in dense communities, their houses closely packed along the narrow streets. Newar hands fashioned the three Valley cities, the one-time capitals, and the numerous ancient towns and villages. The new Gorkhālī masters of the Valley moved into the Malla house literally, adopting, if sometimes grudgingly, the Newar cities and the buildings within as they found them. New styles, largely Mughal and at length European inspiration, were introduced into the traditional architectural milieu only toward the middle of the nineteenth century. The traditional buildings - common house, palace, temple, monastery, public shelter, and other types of community structures - the essential matrix of the Newar settlements, compose a unified architectural style. Provisionally, and for want of a better term, we shall call it here "Newar style." 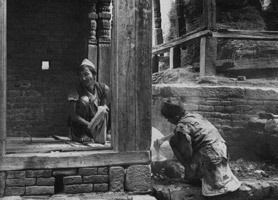 All buildings of the Newar style, whether farmhouse or palace, modest shelter or temple, share the same techniques of construction, and all use the same primary duo of simple building materials, earth (brick, tile) and wood. 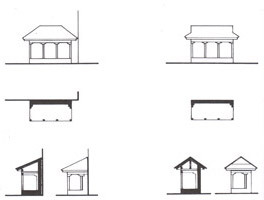 Individual buildings within the style are differentiated according to functional demand and cost. Fig. 1 The dharmaśālā, the particular type of Newar style building pertinent to our discussion, ranges from a simple lean-to of very modest size - shelter at the bare minimum (Figs. 1, 3-5, 7) - to large, imposing, multi-storey structures that in gross appearance are not unlike the related temples (Figs. 21, 26, 36). These shelters go by many names, Sanskrit, Nepali, and Newari, the distinctions between which will be discussed further along. But all - pāṭī, phale, phalacā, maṇḍapa, maḍu, sattal or combinations of these terms - may be conveniently embraced by the common Sanskrit term, dharmaśālā, literally "charitable asylum." The principal function of all Nepalese dharmaśālās is shelter. But they perform many subsidiary services as well, which all types share in some degree. In them the wayfarer - pilgrim, sādhu, and yogi, hillman, farmer, and distant townsman - may shelter briefly from the hot sun or rain, or pass the night. In the more substantial shelters of town and city, professional holy men may stay for weeks on end or even years. Fig. 2These dharmaśālās have no furnishings, kitchen, or domestic staff such as one normally associates with an inn. At best, the more substantial ones may be partially carpeted with straw mats. On these, or more commonly the bare floor, the traveler spreads his own bedding, often no more than a thin, all-purpose shawl. Food is cooked nearby or within over a three-stone campfire (Fig. 2), or in the towns, sometimes procured ready-cooked. Characteristically, a dharmaśālā is built beside a water source - river, pond, well, or fountain (Figs. 3, 4, 10, 12). Frequently, if water is not already provided by nature at the selected site, the donor earns two-fold merit by constructing a water source at the same time as the inn. Thus water is always at hand for bathing and cooking. The surrounding fields are the country dharmaśālā's toilet and in the towns and cities one goes out to the fields or manages as best one can. Fig. 3The simplest, most common type of dharmaśālā, devoted to minimal shelter, the pāṭī of Nepali parlance, phale or phalacā in Newari, is everywhere in the Kathmandu Valley, in the towns, villages, and countryside (Figs. 1, 3-7). The larger more developed types, the maṇḍapa and sattal (Figs. 9-17, 20-23, 24, 29, 30, 36-38) are normally to be found only inside the villages and towns or at pilgrimage sites. Country shelters stand spaced conveniently along the paths and roads (Figs. 1, 4 ), at crossroads, at the bridges and fords (Fig. 3), and mark the approaches to all the larger towns and cities. In the settlements shelters are located beside the city gates (now largely gone), are scattered throughout the byways (Fig. 5), dot the principal and lesser squares, and are beside most temples and shrines. Dharmaśālās are also erected at almost all isolated temples, shrines, or other holy places throughout the Kathmandu Valley, and frequently encircle there an open courtyard and the temple nucleus. Fig. 4Before examining the two culturally prestigious, largest, and most venerable of Nepalese dharmaśālās, Kāṣṭhamaṇḍapa and Dattātreya, it will be pertinent to explore the dharmaśālā in general, briefly viewing the architectural types and social institutions of which these larger buildings are a part. The Nepalese dharmaśālā assumes many physical forms. These may be distinguished and classified only summarily because of shared architectural style and, for the most part, shared cultural functions. But, broadly speaking, there are three principal types of public shelter, the pāṭī (phale, phalacā), the maṇḍapa or maḍu, and the sattal. Further subdivisions, primarily on architectural differences, are also possible. Fig. 5The simplest and most omnipresent free public shelter is the pāṭī  Characteristically, the pāṭī is a partially enclosed, roofed platform (the phale) constructed either as a lean-to against and between other buildings, as a colonnaded porch built into a building (usually a private house) (Fig. 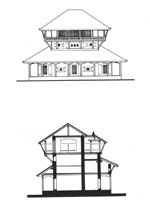 6), or as a freestanding structure with saddleback (double-pitched) roof (Fig. 7). Frequently the pāṭī roof slopes in four directions, the hipped roof (Figs. 1, 3, 4), or, reflecting the common house roof, attaches a short pented collar to the gable ends as a quasi-hipped roof (Fig. 5). Typically the plan of the common pāṭī is rectangular, but occasionally it is square, L-shaped, or even hexagonal. Construction materials are the familiar Newar building elements, primarily brick, tile, and wood plus a limited supplement of clay and stone. The standard platform size is approximately six by twelve feet, the floor of which is raised two or three feet above the ground. The platform is normally made of brick, or brick-faced earth fill, spaced at intervals with short stone piers, and floored with planking. Flooring is often of brick, less commonly of stone, and at times of beaten earth. Earthen floors are less common than they seem to be, for often the original floor planks have decayed and have not been replaced. Fig. 6The majority of common pāṭīs has only one solid wall, the rear one, of brick which is homemade but kiln-fired. At times one or both ends of the pāṭī are also bricked. The front, and - when unbricked - the ends, are colonnaded with widely spaced wooden posts, each set above the corresponding stone pier in the platform below. Both in form and structure the pāṭī roof, whether saddlebacked or hipped, is the same as the roofs of all Newar style buildings. It consists of a wooden framework of beams, rafters, trusses, and posts, held together by wooden pegs. The framework is in turn covered with wooden lathes which support a thick layer of waterproofing clay into which are pressed small, interlocking tiles. The ridge line, hips, and similar joints are protected with larger tiles, overlapping and frequently arranged like a slightly collapsed loaf of sliced bread (Fig. 8). 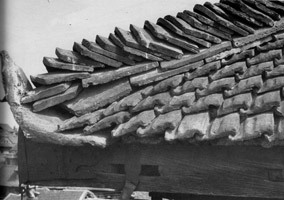 Corner finishing tiles (kuṃpā) are usually aviform (considered "birds of heaven") and give to the otherwise straight roof profile the characteristic unswept "pagoda" look. Fig. 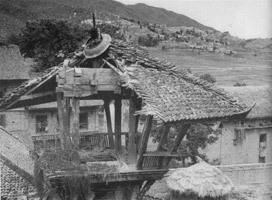 7The Newar-style roof with its burden of wood, clay, and tile is very heavy. 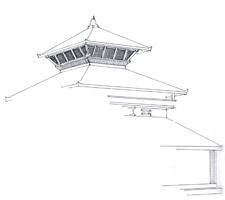 On the pāṭī, essentially as on other buildings, too, the roof is supported in one of two ways. It may rest directly on the solid walls and bracketed wooden columns (Figs. 1, 3, 5), or on an intermediate, false half-storey of brick (Fig. 4). The latter method, esthetically more pleasing, elevates the roof and provides space for a cornice to which may be attached wooden braces, or tuṇalas, which assist in supporting the wide overhang of the heavy roof. Although uncommon in the pāṭī, this half-storey can be floored to provide attic-like storage space. The carved decoration of the wooden elements of the common pāṭī is usually summary, but there are exceptions. The solid rear wall is commonly provided with one or more niches into which are set small stone relief images of gods and a stone dedicatory plaque, often dated and commemorating the donor of the pāṭī. Closely related to the common pāṭī in function, and sharing with it many basic elements of construction, is another type of dharmaśālā, a columned pavilion. It is known in Nepali by the Sanskrit name, maṇḍapa, a derivation of which, maḍu, serves the Newari speakers (Figs. 9-12). Fig. 11Like the common pāṭī, the maṇḍapa is essentially a roofed platform, but it is always completely unwalled and in ground plan uniformly square or very slightly oblong. The small, or common maṇḍapa, invariably has sixteen wooden columns, four on each side and four grouped in a square configuration in the center (Fig. 11). These sixteen columns are such a universal feature of the maṇḍapa that they have earned it the colloquial name, sorah khuṭṭā [ or khutte ], ''the sixteen legged." 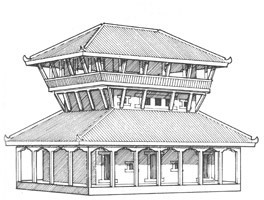 The maṇḍapa is most commonly a one-storey structure. But frequently, too, other maṇḍapas, stacked in diminishing scale, expand the structure to two or three storeys. These multi-storey structures of maṇḍapa plan, however, normally employ on each storey many more columns than the basic sixteen and are usually designated sattals. This expanded form will be discussed further along. The roof of the maṇḍapa conforms structurally to that of the common pāṭī but, as demanded by the ground plan, is always hipped. 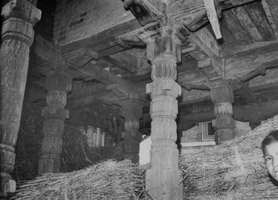 Unlike so many pāṭīs, the maṇḍapa roof is never supported directly on the walls and bracketed columns but by means of the intermediate half-storey and tuṇalas (Figs. 9-12). This half-storey is often floored and frequently has a square, brick-wall core which rests directly on the four center posts (Fig. 18). These center posts are often more sturdy than the peripheral twelve, and when the brick core is absent, are also taller. Then they reach up to the main, or tie, beam of the roof framework and function as queen posts (Fig. 11). The maṇḍapa columns, roof brackets, and other wooden elements are frequently elaborately carved. The maṇḍapa shares all the functions of the common pāṭī and performs additional services as council hall and bourse. In the maṇḍapa community and neighborhood affairs are discussed and it is the approved place for much decision-making concerning the celebration of local festivals. Formerly, too, the maṇḍapa seems to have functioned as a public weighing station and center for market price exchange. There were also maṇḍapas reserved to royalty which served particularly as council halls and at times as coronation sites. Fig. 12Some of these architecturally modest maṇḍapas were once buildings of considerable cultural importance. 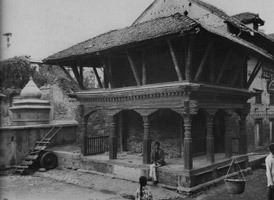 The small maṇḍapa at Paknajol stood at one of the northeastern gates of old walled Kathmandu. There it played a well-defined role as ritual reception hall for gods, kings, and other mortal dignitaries. Even now, in attenuated manner, it continues to perform certain ritual functions. More famous is the Jewel Pavilion, Maṇimaṇḍapa, of Patan (Fig. 9). It is the northern one of a pair (Fig. 12) which flank the stairs leading into the ancient fountain, Maṇidhārā,  in the Patan Darbar Square. Adjacent to the Malla royal palace, Maṇimaṇḍapa served as the council hall and occasional coronation place of kings. Its southern twin was the town weighing station. Maṇimaṇḍapa was also, as it remains today, the convocation site for priests and astrologers to decide the auspicious moment for initiating the annual festival of the Valley's beloved patron, Red Matsyendranātha. The foundation date of these twin maṇḍapas is unknown. Maṇimaṇḍapa, at least, predates A.D. 1701 when "the conference room of kings had become old and ... King Yoganarendra had it renovated." The second aspect which distinguishes the sattal from other kinds of dharmaśālās, is its customary incorporation of a shrine, making it both rest house and temple. These sattal shrines are usually located on the ground floor where they are readily accessible to the worshiper. They may be quite open, the sacred precinct merely railed or demarcated with a square cloth canopy. At times the shrine is semi-enclosed with lattices, but most commonly it constitutes a brick-walled room which may usurp a substantial part of the ground floor. Less frequently, subsidiary shrines or images are installed in the upper storeys, too. Like the maṇḍapa, the sattal is an institution of towns and villages where it is a characteristic feature of the open squares. It also may be located at a place of pilgrimage where, as in the town, too, it is always closely associated with a particular temple. The sattal serves the established community, whole village or neighborhood, in all the ways of a common dharmaśālā. But also it is at once temple, and maṇḍapa-like, council hall, bourse, and, if of royalty, occasional coronation place. The more ambitious sattals, rather than individual donations (unless of a king), are built by communal associations, the gūṭhī, and are maintained by trust funds established for this purpose. 3) a medium to large, two-and-a-half-storey structure of rectangular plan, the ground floor devoted to one or more brick-walled shrines surrounded by a columned porch, the intermediate half-storey walled, and the top storey an open, or partially open, pavilion (Figs. 21-24). The sattal is particularly basic to our investigation of Kāṣṭhamaṇḍapa and Dattātreya. Especially to place them in perspective, therefore, it will be pertinent to examine some specific examples of lesser sattals with reference to their architectural peculiarities and to their cultural role. The simplest, pāṭī-like sattal is well illustrated by the Sundhārā-sattal, a short distance east of the main square of Patan (Figs. 13-15). Known also as the Kṛṣṇa temple, after one of the deities enshrined there, the sattal was built in A.D. 1700. The donors were relatives of Yoganarendra Malla, ruler of the Patan kingdom from 1684 to 1705, who graced the consecration ceremonies for the new building. 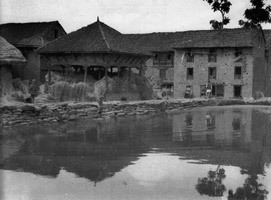 Characteristically, the new sattal was established beside a water source, in this instance the famous Fountain of the Golden Spout, the Sundhārā. This, the sattal 's donors, as a further act of piety, renovated in the following year. Despite being a royal donation, the sattal is of a modest size, a little less then twenty-four feet long and ten feet wide. In basic ground plan (Fig. 15) conforming to the common pāṭī, the Sundhārā-sattal is distinguished by the addition of a second storey, the presence of large enclosed shrines on each storey, and by the richness of its decoration (Fig. 14). Originally the upper floor, here reached by an outside stairway, could be screened at will by lowering intricately carved, wooden swing lattices, a feature in perfect correspondence with the upper storey windows of a Newar house. But now only fragments of the much decayed lattices of the sattal remain. A rather unusual feature of the upper storey is the presence of an āgama, or secret shrine, a masonry-walled room in front of which is the screened sleeping area. The ground floor shrine, immediately below the āgama, just as it would be in a Nepalese vihāra, must have been originally consecrated to Viṣṇu, and his consort, Lakṣmī. Their joint images of stone are now almost obscured by a baroque trinity of metal images, Kṛṣṇa, an avatāra of Viṣṇu, and two of his consorts. Kṛṣṇa's exploits as the divine cowherd, recounted in Book Ten of the Bhagavata-purana, are intricately carved on a long narrow frieze which surrounds the top storey balcony. This, together with other carvings and decorations lavished on the sattal - including atlantes-carved stone piers of the platform - makes this otherwise simple structure an appealing representative of Newar-style architecture. With its delicate charm the sattal certainly was an important ornament of the once temple-filled neighborhood square, now ravished by time and neglect. At present, the principal function of the sattal is that of a temple. Its only social function is to serve as the nightly venue of a group of local residents who gather to perform the bhajana, or worship in praise of Kṛṣṇa. Another of these small, pāṭī-like sattals - and they are common - may be seen in the square of lkhālakhu in western Patan (Fig. 16). A third smaller and more simple than the Sundhārā-sattal, lkhālakhu-sattal is of L-shaped plan, modestly but well decorated, and has no large shrine. 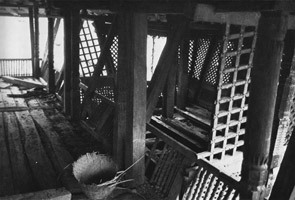 Residual construction elements attest that the upper storey was formerly latticed, but no trace of these remain and the upper storey is now quite open. The foundation of the lkhālakhu-sattal predates A.D. 1663 but it owes its present form to a restoration effected in A.D. 1741. This was at the instance of a Patan citizen in memory of his deceased son. At the same time an image of Nārāyaṇa (now missing) was affixed to the wall and a trust fund established for an annual ceremony of feeding and worshiping cows at the sattal. lkhālakhu-sattal particularly illustrates the problem of classification and nomenclature of the Nepalese dharmaśālā. For although typologically a sattal, it is referred to in the inscription as a sattalphale, hence both sattal and pāṭī, and its common name is Juga-phalacā. Culturally the modern name is not altogether inappropriate inasmuch as the sattal has no further function beyond that of the common pāṭī. An excellent illustration of a medium-sized sattal of maṇḍapa plan is provided by a ruined one in the village of Khãdpu (Figs. 17-20). Known also as Śrīkhaṇḍapura, or Sandalwood City, an alternate Sanskrit name, the village is some two miles south of Banepā, a well-known old Newar town just east of the Kathmandu Valley proper. The very fact that the Khãdpu sattal is now an almost useless ruin in imminent danger of total collapse, makes it an interesting structure to study. For, laid open like a model of sattal architecture in particular and Newar building style in general, the unfortunate sattal's ruinous condition provides us with a visual section which otherwise must depend on the architect's pen. 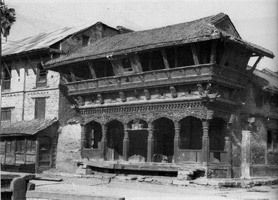 In its decay, as a study of Figures 17 and 19 makes clear, the sattal illustrates from foundation platform to pinnacle the many characteristic techniques of the Newar style of building not easily perceived in complete buildings. Fig. 20The Khãdpu sattal, despite its two storeys, is only slightly more than thirteen feet square and is simply a "sorah khuṭṭā," a sixteen-column maṇḍapa, over which is constructed a second, smaller, maṇḍapa-like storey. The twelve peripheral columns of the ground floor are more delicate than the center group of four on which rests much of the weight of the superstructure (Fig. 20). In this instance the burden does not rest directly on the bracketed pillars but on a transitional brick-wall core such aswe have previously described (Fig. 18). Upon the core, and directly over the four sturdy ground floor pillars, rise the corresponding four pillars of the maṇḍapa above. The small scale of the upper maṇḍapa - in the Khãdpu sattal a mere pavilion - precludes repeating the twelve peripheral columns of the lower storey. They are replaced instead with twelve slanting, bracket-like members which act as partial supports for the roof. The history of the Khãdpu sattal is now forgotten by the villagers and no inscriptions record it. But judging by its use of carved columns of the type found in Kāṣṭhamaṇḍapa (Figs. 18, 28) and a number of the most ancient vihāras, one must assume an early date, one which certainly well predates the seventeenth century. Locally known as the Indra-sattal for its intimate association with that deity, the Khãdpu sattal seems less to have been a permanent inn than a temple and community council hall. It once incorporated a permanent but apparently modest shrine to Indra, and at the sattal were decided all the details concerning that deity's lengthy annual celebration. Formerly, too, in keeping with the Valley-wide custom of displaying images of Indra in raised open pavilions for the duration of his long festival, an image of Indra was exposed in the upper pavilion of the sattal. This custom suggests that unlike the upper storeys of most sattals that of Khãdpu was never enclosed by screens. Its diminutive size, too, almost certainly precludes its use as a dormitory. Ruined and shrineless the Khãdpu sattal still serves the villagers while it stands. Even now the open square beside it is the center of the harvest festivities of Indra, the raingiver, and, until the fruits of his largesse can be taken to each individual home, it is stored within his former shrine (Fig. 17). A small sattal, known as Thasamaḍu, similar to that at Khãdpu, may also be seen in Kathmandu at Thaymaḍu-ṭol, or as it is known to Nepalis, Bāṅgemuḍhā-ṭol. Of two storeys and rectangular in plan, Thasamaḍu no longer functions as a sattal but has been completely renovated by squatters into a dwelling above and a shop below. The sattal was formerly of considerable cultural significance and was particularly associated with the small Nārāyaṇa temple across the street, an ancient shrine recently rebuilt as new. Thasamaḍu once pertained to the sect of Kānphaṭṭā yogis, described further along, who recently unsuccessfully tried to reclaim it from the squatters. The building may well date from at least the fifteenth century although our earliest documented date, a passing reference in a journal (ṭhyāsaphu) is A.D. 1679 (N.S. 799 Bhādra). Fig. 21The third and last discernible architectural type of sattal may be illustrated by a near derelict structure known as the Lakṣmī-Nārāyaṇa temple (Fig. 21). The building stands - and may do so only for a few more years - in the heart of Kathmandu, in Maru-(maḍu-)ṭol, in the shadow of Kāṣṭhamaṇḍapa. No longer even identified as a sattal, the structure is known as the Lakṣmī-Nārāyaṇa temple because of a small three-quarter temple posteriorly attached to the northern, rear wall of the sattal. The temple, together with advanced decay and disastrous renovations to suit those who dwell in the top floor and those who do business in the ground floor, has altered the original building almost beyond recognition. Nonetheless, examined against the background of dharmaśālā architecture, the building leaves no doubt as to its original function. The primitive structure will be best understood from a study of Figure 22, our sketch reconstruction of the original, together with the elevation (viewed from the principal and southern façade), and the plans and section which include the exotic temple structure (Figs. 23, 24). The sattal is a rectangular, two-storey structure, or two and a half if we include the transitional half-storey. The entire ground floor is devoted to three large shrines enclosed by brick walls and surrounded by a colonnaded porch, at once ambulatory (pradakṣiṇā patha) and common pāṭī. The solid masonry walls of the large central shrine, rather than columns, support the superstructure and are continued upward as the walls of the half storey. As previously noted, the function of the half storey is esthetic, a way of arranging graceful elevation for the roof, or as here, for the entire superstructure. The columns of the upper pavilion rest directly over the core walls and together with peripheral columns and slanting brackets support the heavy, hipped roof. Examination of the top storey reveals that, with the exception of narrow masonry piers at the corners, it was almost certainly an unwalled, colonnaded pavilion, surrounded by a columned balcony, open or, more probably, fitted with protective lattices to provide the expected sheltered sattal dormitory. All of the intercolumnar space of the pavilion has been crudely filled in by the present tenants, but here and there the old columns remain. We have been unable to reconstruct the history of this important building. To judge by the superb carving of the columns and shrine doors of the ground floor, the buildings must long antedate the seventeenth century. But the earliest date associated with the building corresponds to A.D. 1780 (N.S. 900 Māgha), inscribed on the tympanum over one of the shrine doors. The history of the religious use to which the primitive sattal was put is equally obscure. The principal ground floor shrine is empty of images and the worn and dusty carvings over the door - perhaps a yoginī and the trinity Buddha, Dharma, and Saṅgha personified - are effectively silent. Avalokiteśvara is worshiped in the eastern shrine and an image of Mañjuśrī is worshiped before the closed door of the western one. With the exception of the image of Mahākāla standing in the ground floor ambulatory, all of the remaining iconography of the building is Vaiṣṇava. It includes roof brackets carved as Viṣṇu avatāras, balcony reliefs of Kṛṣṇa fluting, and, or course, the Vaiṣṇava-decorated Lakṣmī-Nārāyaṇa temple. Speculatively, it seems possible that the original sattal, in its temple role, was devoted to Buddha, but with later addition of the Lakṣmī-Nārāyaṇa temple was renovated to depict the corresponding Vaiṣṇava themes. Certainly the Vaiṣṇava roof brackets and pavilion reliefs do not seem to belong to the same time as the delicately carved columns of the ground floor. The building now, of course, has no function as a sattal. As we have said, the upper pavilion has been completely renovated as a dwelling place and the ground floor ambulatory parcelled out among a number of petty merchants each of whom has made his own crude modifications. The defunct shrines serve the merchants for storage purposes and even the Lakṣmī-Nārāyaṇa temple, although still in worship, is not spared that indignity. Two almost identical sattals, the Inn of the Lions, or Siṃha-sattal, and Kavindrapura also stand in Maḍu-ṭol, which thus possesses along with Kāṣṭhamaṇḍapa four large sattals in a single crowded square. The Siṃha-(or to use its ancient name, Sīlyã-) sattal, like the nearby Lakṣmī-Nārāyaṇa, has been altered almost beyond recognition. It has the distinction, however, of retaining its upper pavilion in its original use as a sattal. There under the watchful eye of Kṛṣṇa seated within a large latticed shrine, mendicant ascetics sleep wrapped in their thin shawls even now. Afternoons find the shopkeepers chatting and resting within, while the evenings are devoted to the bhajana of Kṛṣṇa. The very large, four-storeyed, triple-roofed Kavīndrapura, a seventeenth-century royal donation, is empty and derelict. Its open porch serves as a fruit stall, beside which in one corner is a small shrine at which is worshiped from time to time the damaged image of"Nāsadyo," Śiva Naṭarāja. 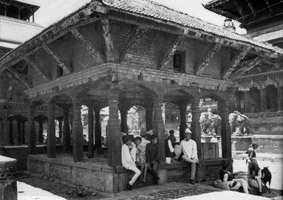 Kāṣṭhamaṇḍapa, the Wooden Pavilion, is a three-storey sattal of maṇḍapa plan, the largest dharmaśālā in the Kathmandu Valley, or indeed of any type of building - palace unit or temple - in traditional Newar style (Figs. 26-32). In breadth just short of sixty-six feet and almost the same in height, Kāṣṭhamaṇḍapa, or Maḍu-sattal, its alternate Newari name, is nonetheless only the simple sorah khuṭṭā writ large. Like the morphologically related common wayside pāṭī or the village maṇḍapa, Kāṣṭhamaṇḍapa is erected on a raised brick platform, here of necessity more massive and therefore stepped (Fig. 29). Four short flights of stairs, one on each side, give ready access to the vast, tiled ground floor. The ground floor is essentially a columned maṇḍapa, modified within by the addition of brick comer piers and partial brick partitions - special features demanded by the massive superstructure - and without, by the addition of a porch with an elevated pavilion in each comer. The porch and its pavilions are exotic to the basic maṇḍapa, which they surround, but considerably increase the ground floor space. Each of the pavilions functions as a small pāṭī and in one of them the nightly bhajana takes place. The interior section of the ground floor, the true maṇḍapa, corresponds to the little Khãdpu ruin, with four large central columns surrounded by smaller peripheral ones, all bracketed (Fig. 31 ). At Kāṣṭhamaṇḍapa, however, rather than the expected twelve peripheral columns there are thirty-two. This is occasioned by pairing the columns for extra strength and by repeating the comer columns (displaced by the intruding piers) as engaged columns at each side of the piers. The four central pillars, each twenty feet tall and fifteen inches square, are provided with massive capitals (Fig. 27). Heavy beams rest on these pillars which, assisted by the surrounding columns and masonry piers, bear the burden of the two-storey structure. The roof over the added porch and pavilions depends in part on the maṇḍapa columns and beams for its support, but also particularly on two series of smaller, additional columns devoted to this purpose. The second storey of Kāṣṭhamaṇḍapa, reached by a steep open stairway with trapdoor closings, like the Khãdpu ruin repeats the ground floor maṇḍapa in diminishing scale. Its four centrally grouped columns, now shorter and reduced to ten inches square, rest directly above the massive four of the ground floor (Fig. 31 ). These are in turn surrounded by the expected peripheral columns, in a pattern again repeating that of the ground floor. Like the lower floor, too, the second storey maṇḍapa is surrounded by a narrow balcony, protected by a wide roof overhang supported in part with a special set of columns. (Fig. 28). Fig. 32The third and top floor is reached by ladder through a trapdoor and repeats anew the maṇḍapa. The four central columns are further reduced by a third (now five inches square) but are no larger than the surrounding columns. The latter - now minus the stone piers, superfluous at this level - are evenly spaced, with six columns, rather than the expected four, on each side. Like the large maṇḍapas below, the uppermost maṇḍapa, too, is encircled with a balcony. Almost a duplicate of the vestigial upper pavilion at Khãdpu, the topmost floor of Kāṣṭhamaṇḍapa is also open. 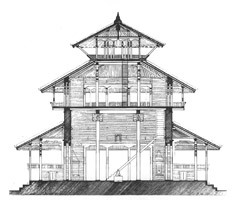 Residual elements (grooves and catches on the slanting struts of the balcony) attest that the pavilion was originally fully lattice-screened as we have reconstructed in figure 32. 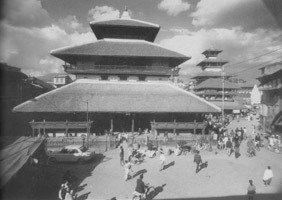 The roof of Kāṣṭhamaṇḍapa is made by the same techniques and materials used for any Newar style building. The four central posts of the topmost pavilion serve as its queen posts, just as they often do in the roof of the village maṇḍapa. Of the hipped variety, the roof is tiled and finished with a gilt finial. The hips and joints of all the roofs have surrendered their former "breadslice" tiles in favor of cement, an anomaly dating from the recent restoration of the building. Kāṣṭhamaṇḍapa is very modestly decorated. The four massive ground floor pillars are uncarved, their severity relieved only by the lion-head and foliate capitals almost indistinguishable in the shadowy heights above. 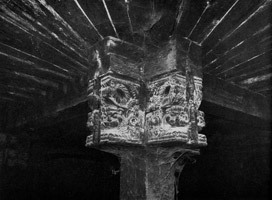 All the smaller columns and brackets are simply carved and correspond stylistically to those found in many of the oldest Newar style buildings (Fig. 28). An exception to the general plainness of the decoration is the wooden balustrade of each of the four ground floor pavilions. These balustrades (now much restored) alternate groups of turned rails and relief panels of divinities beneath which is a delightful miniature frieze fringed with wooden pendants. Fig. 33As is characteristic of most sattals, Kāṣṭhamaṇḍapa, too, has a religious affiliation and contains a principal shrine and several minor ones. The main shrine occupies the center of the ground floor maṇḍapa, guarded at each corner by the four great sustaining pillars. A simple, cloth-canopied, railed enclosure demarcates the shrine. Exposed on a dais within is the image of Gorakṣanātha, the chief cult object of the sattal, to which we shall return further along (Fig. 33). Images of Gaṇeśa, each a different aspect, are set into niches in the ground floor corner piers. 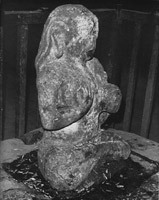 Shrines of many other deities, Buddhist and Hindu, were dismantled during the 1966 restoration of the sattal. The motifs of the pavilion friezes, too, in keeping with the former eclectic assembly of deities within, are Buddhist and Hindu, the linga beside the stūpa. More sparsely decorated even than the modest little Sundhārā sattal, and in truth a rather squat and ungainly building, Kāṣṭhamaṇḍapa, nonetheless, commands a preeminent place in the history of Nepalese culture. 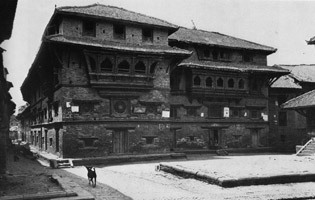 In the architectural realm alone, it qualifies as the most outstanding Newar style building, both in size and antiquity. And beyond this claim, the old sattal is significant for its intimate association with the broader aspects of Nepalese culture, playing a well-defined role in religion, social practices, and folk belief. Its history is entwined with that of the development of the capital city, its namesake and in whose heart it stands. Witness to and participant in some eight centuries of Nepalese cultural development, Kāṣṭhamaṇḍapa presides, even now, over the rapid westernization of the capital around it. We cannot establish an exact date for the foundation of Kāṣṭhamaṇḍapa. But circumstantial evidence almost certainly points to a time anterior to, or in, the early twelfth century A.D. These dates fall in the post-Licchavi ("Ṭhakurī") period of Nepalese history, a meagerly documented "Dark Ages" between the decline of the Licchavi state and the emergence of the Malla one. It is characterized by political anarchy in which the Kathmandu Valley was fragmented into innumerable states or "kingdoms" even more petty than the city-states of the late Malla period. Their capitals correspond to a number of the old Valley towns. Fig. 34Kathmandu did not then exist even as the singularly small city - in extent scarcely a square mile - it was to become as a Malla (and early Śāha) capital (Fig. 34). The post-Licchavi/early Malla Kathmandu consisted of three separately named and separately governed states, the "three cities" (svaṃdeśa). Two of these lay in the northern half, one in the southern, of the subsequently unified city. The boundary between the northern and southern states lay just south of the present city's central square, Hanūmān Ḍhoka and its southern extension, Maḍu-ṭol, named after the sattal within. In conformance with a general phenomenon of the post-Licchavi period, in which-at least for literary purposes-many Valley towns were given alternate Sanskrit names, the settlement surrounding Maḍu-ṭol also acquired one. This was Kāṣṭhamaṇḍapa, the City of the Wooden Pavilion, as we find it first used in a manuscript dated A.D. 1143. There can be little doubt that the "wooden pavilion" is the wondrous, outsized sattal which by then had already become a landmark in the area. The sattal not only dominated the central town square but stood just beside the highway from India to Tibet, an ancient Licchavi artery. There, as a monumental edifice it began to symbolize, and at length became synonymous with, the city itself. The new city name, Kāṣṭhamaṇḍapa, appears in the twelfth century, the thirteenth, and with increasing frequency thereafter. Subsequently the name embraced the two contiguous cities, ultimately united to the central one as the Malla capital. Kāṣṭhamaṇḍapa as a city name remained current into the seventeenth century, alternating then with a newly coined name, Kāntipura. In the eighteenth century, on the Gorkhāli tongue, Kāṣṭhamaṇḍapa became Kāthmāḍaũ, the Kathmandu of today's accepted usage. Although an eleventh-twelfth century foundation date for the sattal can hardly be questioned, certainly the building now standing has been much restored. Buildings of brick, tile, and wood demand constant repair (to judge them today, at least) and Kāṣṭhamaṇḍapa must ofttimes have been repaired and renovated. Ordinarily, these repairs would have been a rather piecemeal operation - here a column or two, there a few roof tiles, or perhaps at length a new roof. These repairs, while certainly gradually substituting new elements for old seem to have made no major alterations of the original plan. The recent extensive restoration of the badly deteriorated building, while replacing many elements, also carefully respected the basic structure. But while we are no longer sure which parts of the extant building are original we may be almost certain that among them are to be counted the great platform and its four central columns. We do not know who built the sattal. It may have been the gift of a group, a customary proceeding even for a small sattal, of an individual, or most probably, as Bāburāma Ācārya suspects, a king. Two legends, one local, the other Rājasthāni, name individual, but different donors. The Nepalese tale, recorded in the chronicles  and still current in the bazaar, tells of a Kathmandu citizen  who, chancing to apprehend a wishing tree, or kalpavṛkṣa,demanded of it another tree with which to build a sattal. The wish was granted and the tree - felled, according to Kathmandu tradition, on the banks of the Ikhāpukhu, the Boundary Pond, even now a scant half­mile away - was duly delivered. Not only was the prodigious tree sufficient to construct the desired sattal - even one the size of Kāṣṭhamaṇḍapa - but enough scrapwood remained, according to popular belief, for building a vihāra and a second smaller sattal as well. Both of these stand nearby, the vihāra the decaying Torumula­ mahāvihāra, or Sikhamu-bahāl, the sattal, the Inn of the Lions, previously mentioned. The Rājasthani legend occurs in a sixteenth-century pilgrim's guide, the Śrī-nātha-tīrthāvalī. According to the Indian account, the builder was the Venerable Lopi, Lopipāda or Lopinātha, a saint (siddha) belonging to the Nāthas, a Śaiva sect of wandering ascetics. Lopipada himself brought the tree from Śiva's Himalayan abode, Mt. Kailāsa, "long ago" to Kathmandu where, "covering over a pond [ at the selected site, he] cut the tree into four pillars upon which he built a three-storey building." In Kathmandu, even now, the name of Lopipāda is perpetuated in the nightly bhajana performed in the sattal, as they sing "Siddha Lopipāda, who wears the harahara garland and who performs yoga ... " But it is not clear whether this represents an oral tradition - as would be customary in the bhajana - or is a recent borrowing from a literary source. Kāṣṭhamaṇḍapa was also the temple of Lord Pācāli (Pācāli-bharāhra), whose name is invoked in the tāmrapatra of A.D. 1333 still affixed to the building. In the inscription Lord Pācāli is petitioned as the divine witness to a political pact and made guardian of certain funds deposited as a gage in his temple, the sattal. Unquestionably the deity may be identified as the tutelary god of one of the Kathmandu pāñcālis (pāñcalikā), an ancient administrative unit whence the modern pañcāyata institution of modem Nepal is descended. Even in the Licchavi period it was the custom of the pāñcāli to worship a special tutelary deity and to participate in a communal feast. That the deity of this particular Kathmandu pāñcāli is to be equated with the deity now known as Pācali Bhairava seems probable. Pacali Bhairava is today a much revered deity, essentially regional and particular to the southern half of Kathmandu. His annual festival terminates at Hanūmān Ḍhoka, the old palace near Kāṣṭhamaṇḍapa, and on every twelfth year the Nepalese king exchanges swords with the deity at a small sunken shrine just in front of the principal façade of the imposing sattal. Thus the continuing intimate association of Pācali Bhairava with the sites strongly suggests that the sattal was formerly his shrine. That similarly the satlal has Buddhist associations also seems clear. It may not be altogether fortuitous that the name of the legendary founder, Lopipāda, resembles that of Lui-pā, or Luyi-pā, a historical figure of the late tenth-early eleventh century, who is generally taken to be the first Buddhist siddhācārya. The harmony of his dates with those of the sattal's probable foundation suggests at least a possible link between the two. His companion and co-author, Dipankara Śrī-jñāna, is known to have gone to Tibet in 1042  but unfortunately we know nothing of the travels of Lui-pā into or through Nepal. Credence to a former Buddhist association with Kāṣṭhamaṇḍapa is lent by contemporary Buddhist practice. A trust association (gūṭhī) of Buddhist Newars devoted to Kāṣṭhamaṇḍapa affairs, who live in an adjacent courtyard, perform an annual ceremony in the sattal. This is on the occasion of the Buddhist festival, pañcadāna (the five offerings), celebrated in Kathmandu in the fourteenth day of the dark half of the month of Bhādra. At that time the gūṭhī installs for worship in the northwest pavilion of Kāṣṭhamaṇḍapa Buddhist images, a banner painting (paṭa), and the old manuscript mentioned in note thirty-two. At the nearby crossroads they erect an ancient, collapsible wooden pavilion (stored meanwhile at Kavīndrapura-sattal) which they claim is the true "wooden pavilion" constructed from the wood of the single tree. 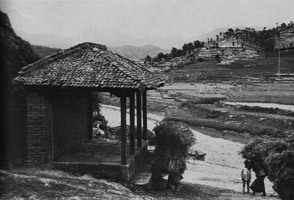 From this pavilion they distribute cooked rice as their offering to the Buddhist officiants of the Kathmandu vihāras. Kāṣṭhamaṇḍapa, like the twin to Maṇimaṇḍapa, very likely also served as a market exchange. This is suggested by the Nepalese legend of the sattal's foundation, cited above. As a reminder to the wishing tree, which had promised to remain in the city until such time as oil and salt were sold at par, the celebrants of the special annual worship at Kāṣṭhamaṇḍapa "called out loudly that salt and oil were not sold at one price to that day." In addition to these special functions, the sattal must have served the townspeople in all the many supplementary ways we have already discussed for the village maṇḍapa. Kāṣṭhamaṇḍapa, however, was destined to assume an altogether new and primary role as temple to Gorakṣanātha and lodging for his disciples, the Nāthas. One school of the Nāthas ("lords, patrons") is known as the Kānphaṭṭā, or "pierced-ear" yogis, after their custom of slitting the ear pinna for the insertion of heavy disc earrings, the mystic Kānphaṭṭā badge of initiation. They are akin to the Kāpālika, or "skull men," also Śaiva and allied to the Pāśupatas, devotees of Lord Śiva Paśupāṭī. The Kāpālika are extremists who, formerly at least, decorated themselves with human bones and carried a human skull as an alms and food bowl. They have a long history in India where in the seventh century A.D. their grisly dress prompted comment by the celebrated Chinese pilgrim, Hsüan-tsang. The poet Bāṇa also describes the Kāpālikas in his tale, Harṣacarita. Similarly, the early appearance of the Kāpālikas in Nepal is suggested by a mid-seventh century reference to "teachers garlanded with skulls." There are now very few Kāpālikas in India and none, as such, in Nepal. But the Kusale, a Newar unclean caste group  some of whom bear Kāpālika as surname, are clearly their descendants. Called also Jogī, the Kusale, like the Nāthas, claim Gorakṣanātha as their patron. They are now family heads and for the most part occupy themselves with their ordained menial tasks, among which are important ritual functions in Newar funeral ceremonies. But once a year certain of them still don their gruesome bone ornaments and, Śiva's ḍamaru in hand, mutely go a-begging in the ancient way, a brief resumption of their ancestral role as Kāpālikas. The intimate association of Kāṣṭhamaṇḍapa with the Nāthas and their patron, the siddha - and, as some believe, Śiva reincarnate, Gorakṣanātha - dates from the late fourteenth century. It is attested by inscriptions, legends, the character. of its occupancy into recent times, and by the presence within of Gorakṣanātha as the chief cult object. The popularity of the Gorakṣanātha cult in Nepal - affirmed by teeming inscriptional references - flowered between about A.D. 1367 and 1482, a remarkable period of Nepalese history corresponding to the rise of Sthiti Malla and the reigns of his sons and of his grandson, Yakṣa. Indeed, Sthiti saw fit to mark his devotion to the cult by a rather spectacular deed, the gift of Kāṣṭhamaṇḍapa as a temple for the great siddha and a lodging for his disciples. This was in A.D. 1379 as recorded in one of the oldest copperplate inscriptions fastened to the sattal: "In N.S. 499 ... The Hariganas [followers of Hari (=Śiva), i.e., the Kāpālikas] received this building of Yaṃgala [another of the city's many names] by order of Jayasthiti Malla ... from this day it was theirs ... It is given by the king." Gorakṣanātha, too, is mentioned in the text. Subsequent inscriptions also attest the new bond between Kāṣṭhamaṇḍapa, the Nāthas, and their tutelary deity. One of these, for example, a tāmrapatra dated A.D. 1465 (N.S. 585 Āṣaḍha), invokes the Nātha patron, Gorakṣanātha, and names the sattal as a residence for yogis in whose care it is entrusted. Another, dated A.D. 1485 (N.S. 605 Āśvina) makes provision for feasting yogis on their return from the arduous pilgrimage to Gosāinkuṇḍa, a Śaiva pilgrimage site in the high Himalaya, and to which the Nāthas even now annually repair. In attenuated manner, too, even when the numbers of wandering ascetics had dwindled away in favor of settled family life, the sattal, like the maṭhas and vihāras, remained in the hands of their descendants. The Kānphaṭṭā of the maṭha of Mṛgasthāli, Pasupāṭīnatha, until recently asserted their legal ownership by collecting rent from the shopkeepers installed within the precincts of the old sattal. Bāburāma Ācārya, in his exploration of the sattal twenty years ago, noted the number of Kusale families - former Kāpālikas, as we have seen - established in makeshift quarters throughout the building. 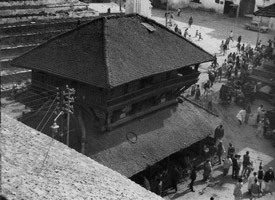 More recently, Bikrama Jit Hasra, resident in Kathmandu just prior to 1966, noted that the sattal held a "swarm of jogīs, men and women who live there, [and] a tax called Jogī-paisa is raised to support them." 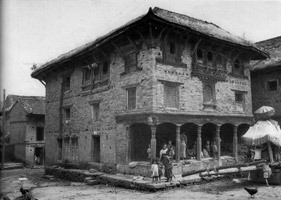 It was essentially these Kusale, or 'jogīs," who comprised the forty-five families which together with their dwelling units were removed from the sattal when the building was restored in 1966. Since that date Kāṣṭhamaṇḍapa became a protected historical monument and accommodates no permanent residents. The top storeys are closed and only the ground floor remains accessible for use as a common pāṭī and for the worship of Gorakṣanātha. Official worship is performed by the Kānphaṭṭā yogis domiciled at the nearby Hannuman Ḍhoka matha who like their brethren yogis of Mṛgasthāli claim but cannot exercise ownership of the antique sattal. The sattal may be emptied of Nāthas, but their patron, the Śaiva saint and Śiva avatāra, Gorakṣanātha, remains. Represented in the form of a stone image of moderate size and uncertain date - but probably installed ca. 1379, the date of Sthiti's gift to the Harigaṇas - Gorakṣanātha sits on a dais in yogic posture at the heart of the great maṇḍapa (Fig. 33). His right hand is turned against his breast, the left dangles as if to hold an attribute which now cannot be discerned. The long hair, emblematic disc earrings, and miniature charm box, or yantra, around his neck almost certainly identify the image as Gorakṣanātha. Some, however, believe it to be the legendary builder, Lopipāda, and still others identify it with the Buddhist siddha, Padmasambhava. Fig. 35If, as it seems, the image does represent Gorakṣanātha, it is in the Kathmandu Valley a rare representation indeed. For representations of Gorakṣanātha are very uncommon and he is almost always worshipped in the form of his symbolic footprints (pādukā), detached feet, or less frequently, a single hand in abhāya mudrā. To our certain knowledge, at no other of his several shrines in the Valley - and these are numerous - is Gorakṣanātha worshiped in iconic form. Indeed, as first noticed by the devoted Newar scholar, Hemarāja Śākya, the single other example which predates the irruption of the Gorkhālīs occurs on a small stone relief affixed to the wall of an obscure pāṭī in Patan. There an image of Gorakṣanātha, his identity emphasized by the inclusion of the pādukā above, is flanked by two Nātha disciples. Teacher and disciples are seated in yogāsana, wear the distinctive symbolic earrings of the Kānphaṭṭā, and are accompanied by a large triśūla, emblem of Śiva and symbol of his followers (Fig. 35). The relief bears a short inscription, dated A.D. 1616 (N.S . 737 Kārtika), and records the establishment of a trust fund by one, Amṛtanātha, for the purpose of worshiping his teacher, Gorakṣanātha, and for the annual feasting of Kusale families. The history of the introduction of the Gorakṣanātha cult into the Kathmandu Valley is fraught with uncertainty. In Valley tradition Gorakṣanātha is considered the disciple of an even more famous Natha siddha, Matsyendranātha (traditionally identified with Lui-pā, it may be noted), and their legends and cults are inextricably linked. The many strands of the tangled web of their story, made more tangled by contradictory versions prevalent among Hindus and Buddhists, may never be unravelled, nor the history of the advent of either into Nepalese culture be clarified. But for both siddhas a venerable antiquity is suggested which clearly long predates the presentation of the imposing sattal to the devotees of the one, Gorakṣanātha. Certainly, for the past six centuries these Harigaṇas, treading barefoot in the ancient ways to Śiva's Himalayan abode, have rested in the remarkable dharmaśālā given over by royal decree to their use in the main square of the Valley town. Dattātreya presides over the large square of Tacapāl at the eastern end of Bhaktapur (Figs. 36-40). Less celebrated architecturally and historically than Kāṣṭhamaṇḍapa, and a third smaller, Dattātreya nonetheless is worthy of greater interest than it has heretofore been accorded. Considered by layman and scholar alike to be a temple, Dattātreya in fact may be so defined only by reason of the function it now performs. Architecturally it does not conform to any of the several characteristic patterns of Newar temple building and is, in fact, a sattal subsequently modified and converted into a temple. Its chief cult object - and whence the current name of the building - is Dattātreya, saint, sage, and yogi, an avatāra of Viṣṇu in particular and with Brahmā and Śiva the Hindu trinity incarnate. At the Bhaktapur shrine it is particularly the deity's Vaiṣṇava aspect that is emphasized. Viṣṇu Viśvarūpa presides on the metal relief toraṇa, or tympanum, over the shrine entrance, and Viṣṇu's vāhana, Garuḍa, perches on a tall pillar set before the temple. A small stone relief of Dattātreya as a meditating yogi is also to be seen beside the shrine entryway. The original building was a three-storey sattal of square maṇḍapa plan, morphologically one with the Khãdpu sattal and with Kāṣṭhamaṇḍapa and roughly between them in size. Subsequently, to improve upon an existing shrine or to establish a new one, the sattal was extensively remodeled, modifications which - functionally at least transformed it into a temple. Extensive changes were made to the existing structure and a new element, a small ancillary porch, was joined to the western façade of the old building. Examination of the accompanying drawings (Figs. 38, 39) attest the correspondence of the primitive structure with the maṇḍapa sattals previously described. It was of square plan, 38 feet 8 inches on each side, including the plinth which extends as a two foot wide shelf around the building proper. The ground floor maṇḍapa was almost certainly once open, as we see in Kāṣṭhamaṇḍapa still, and like it consisted of the maṇḍapa proper surrounded by a roofed, colonnaded porch. But when the sattal was converted to a temple the maṇḍapa proper was walled in, except for a small doorway, and the surrounding porch became its covered ambulatory, a feature consistent with many true Newar style temples of square plan. The ambulatory was further enclosed by fitting lattices between the columns, a posterior addition attested by their clumsy attachment. The porch no longer serves as an ambulatory but has been partitioned haphazardly into several sections. Functionally the converted maṇḍapa corresponds to the sanctum, the garbha gṛha, of a bona fide Newar style temple of square plan. Structurally its large size is atypical of them. It is not possible to examine the interior of the sanctum, but one must presume the presence there of the four central bearing columns, as we have reconstructed them in the drawings. The upper storeys are also essentially columned maṇḍapas of successively diminishing size, each surrounded by a roofed but otherwise open balcony, comparable to Kāṣṭhamaṇḍapa. Similarly, too, the upper storeys must have been reached formerly by an inner stairway. The conversion of the ground floor into a closed sanctum necessitated a new route, accomplished by an altogether unconventional arrangement of exterior ladders and trapdoors. One ladder leads from the ambulatory through and over the lowermost roof to a second outside ladder which accedes to a trapdoor in the second storey balcony floor. At this level one rejoins the original ladder-like interior stairway. Modifications of the upper storeys is relatively slight and largely consists of partial crude bricking of intercolumnar spaces to semi-enclose the maṇḍapas. That the upper floor was formerly latticed is suggested by the same residual elements one sees in the corresponding storey at Kāṣṭhamaṇḍapa. It is the large, two storey porch attached to the western façade of the sattal that particularly obscures the true dharmaśālā morphology of the Dattātreya temple. In this Dattātreya closely compares to the Lakṣmī-Nārāyaṇa in Maḍu-ṭol, Kathmandu, in which a supplementary temple structure was joined similarly to a pre-existing sattal. The porch of the Dattātreya is slightly more than ten feet wide and extends laterally across the full width of the building. It is surmounted by a non-functional half cupola which is attached to and interrupts the second-storey balcony. The structural anomalies attendant to the latter-day addition of this porch are everywhere apparent. The marked break between the old and new sections of the plinth is obvious, and the original ground floor peripheral columns are still in place, as is the railed balcony of the second storey (Fig. 40). The narrow antechamber created in front of the shrine by the porch addition is atypical of Newar style temples of any kind. It was perhaps a vague imitation of the entry hall, or mukhamaṇḍapa, common to Indian temple architecture. More probably this resemblance is fortuitous, since rather than an axial hall guiding the devotee to the shrine, the porch is transverse to it. Further, it may be noted that the most common Nepalese practice is to reserve entrance to the shrine for the temple priests alone. Little has been known of the history of the Dattātreya. Heretofore our only evidence has been the conflicting entries in the chronicles which credit it to at least three different builders: Yakṣa Malla, ruler of the Kathmandu Valley, A.D. 1428-1482, and his son Rāja as co-builders; Viśva Malla, ruler of Bhaktapur, 1548-1560; ,and a queen, Gaṅgarānī, in A.D. 1589. Scholars have accepted Yakṣa Malla to be the builder. This is the correct attribution as now confirmed by an unpublished bilingual Sanskrit and Newari inscription, a large stone slab leaning against the northern end of the porch (Fig. 36). The stone is so badly damaged that not a single complete sentence remains. But sufficient to our study are several critical and revealing fragments. The inscription records the completion of some particular work carried out by King Yakṣa Malla. From the isolated word "maṇḍapa" together with the name of the presiding lunar mansion (nakṣatra) in the preceding date line we can deduce that the unidentified work was almost certainly the sattal. For the nakṣatra is Punarvasu, considered by the ṣāstra Muhūrta-cintamaṇi as a particularly auspicious sign under which to erect a building. The year date is unfortunately effaced in the inscription but Yakṣa's son Rāja, among others, is mentioned. If, as the chronicle asserts, Rāja was co-builder with his father, the son's death by 1467 establishes a terminus ad quern for the foundation of the sattal. That Rāja Malla was associated with the building is perpetuated by legend, at least. According to the incumbent chief priest, the mahanta, the temple site - reminiscent of Kāṣṭhamaṇḍapa's legend - was a pond. In the middle was an island embellished with a large tree, under which a famous guru died. The latter's disciples built a shrine there in his memory and it was this which Rāja Malla later renovated to make the existing structure. That Yakṣa's (and perhaps his son's) original donation was a sattal for Śaiva ascetics, instead of a temple to Dattātreya, is also suggested by the fragmentary inscription. For rather than to Dattātreya (of whom there is now, at least, no discernible mention) the invocation is to Śiva Naṭarāja. Further, the building's primitive or popular name was formerly merely Tao Capāla, "the grand rest house." Not unlike the transferral of the name of Kāṣṭhamaṇḍapa to the city, it is from the imposing Tao Capāla that the name of the surrounding neighborhood, Tacapāl, is derived. Since the building long postdates the foundation of Kāṣṭhamaṇḍapa, to which as an original maṇḍapa sattal it so closely compares, the Bhaktapur sattal was possibly even built to imitate it and was consecrated to the same use that the illustrious Kathmandu sattal then had. The Bhaktapur legend in this respect is suspect for, inspired no doubt by the Kathmandu legend, it also claims for Dattātreya a miraculous construction out of a single tree. Further, we know that Yakṣa Malla established the Yakṣeśvara temple near his palace at the western end of the city in imitation of, and as a substitute for, the temple of Paśupatinātha. Both buildings, therefore, the sattal and the Paśupatinātha copy, may have been forerunners in the artistic competition among the three capitals which so characterized their relations in the centuries after Yakṣa's death. Fig. 41It is possible that to Viśva Malla, Yakṣa's descendant, we owe the modification of the sattal to the Dattātreya temple. Indeed, this train of events is suggested by the chronicle entry itself which states that having built the Dattātreya temple Viśva Malla made it over to the Sannyasis [yogis] for whose residence he built a matha ... " Thus it is possible that the new maṭha - to be identified as the nearby Pūjāri-maṭha (Fig. 41) which even now is intimately associated with the Dattātreya temple - was offered to the yogis as substitute quarters for their sattal turned temple. If so, the date of the beautiful Pūjāri-maṭha would also be ascertained in the second half of the sixteenth century during Viśva Malla's reign. Legend, however, assigns the maṭha to the same disciples who built the first primitive memorial shrine on the island nearby. Other evidence, however, suggests that the renovation of the sattal as a temple to Dattātreya was effected by Jitāmitra Malla, ruler of the Bhaktapur kingdom from A.D. 1673 to 1696. According to an unpublished inscription carved on the Garuḍa pillar in front of the Dattātreya, one Kṛpalagiri's "guru's guru" was the first pūjāri of the Dattātreya temple. We know from another inscription, also unpublished, engraved on a bell in the Pūjāri-maṭha that Kṛpalagiri was the presiding pūjāri of the Dattātreya in N.S. 883 Vaiśakha (A.D. 1763), during the reign of Raṇajit Malla. His teacher's teacher, then, may be presumed to have been installed in the reign of Raṇajit's grandfather, Jitāmitra. A recently discovered and unpublished ṭhyāsaphu also credits the building of the Dattātreya to Jitāmitra. The curious porch of the Dattātreya that has so radically compromised the original building was not added until A.D. 1849. It, together with the gilt doorway of the sanctum, was donated by the presiding mahanta in memory of his guru'sguru. At present Dattātreya has no function as a sattal. An exception is a single yogi who at the time of our study had permanently installed himself in one of the partitioned sections of the former ambulatory. The sattal's ancient function as a dharmaśālā for yogis seems to be attested, however, at the annual Śiva-rātri, the night watch of Śiva. At that time thousands of pilgrims, sādhus, and yogis pour into the Kathmandu Valley to pay their respects to Lord Śiva Pasupāṭī. Many yogis also walk another seven miles beyond to the Dattātreya temple where naked and ash-besmeared, they gather around their fires in the open square immediately adjacent to the temple. Drawn to Dattātreya, perhaps, by that deity's yogic association as god of charms and spells, this assembly may also perpetuate a more ancient venue within the sattal. The study of Nepalese architecture heretofore has been confined almost exclusively to temples and vihāras of the late Malla period. These buildings are largely of the seventeenth and eighteenth century, plus a few survivals from the fifteenth and sixteenth, and, in Kāṣṭhamaṇḍapa, a single example from the eleventh or twelfth century. But these buildings, of course, mark only the culmination of a long process of evolution of the architectural tradition of the Kathmandu Valley. For although archeology has yet to reveal any complete structures, the presence of a variety of buildings anterior to Kāṣṭhamaṇḍapa is well attested by inscriptional references and by the occurrence of numerous architectural fragments above ground. Inscriptional references usually are to temples and monasteries, but there is occasional note of other structures as well. Dharmaśālās of various types, for example, are mentioned in Licchavi period inscriptions. Entries such as "a building and a field connected with a fountain," "near the little Ponti-maṇḍapa," "the Brahmans who live in Siṃha-maṇḍapa," or "the water source east of the place where the people rest their burdens" leave no doubt that the dharmaśālā as we have described it for contemporary Nepal was a well-established Licchavi institution as well. The post-Licchavi documents are equally eloquent. From them we learn that in A.D. 1171 '"the wise man Jayacandra commissioned a spout of pure water together with the nearby pattikā [pātī], granted a field as a trust for keeping the road clean, and gave four coins to roof the pātī". Similarly, King Someśvaradeva (ca. 1178-1183) built a sattal and ca. 1328 an unidentified donor offered in Bhaktapur a maṇḍapa together with a dhārā. From these and similar documents, then, it is clear that the dharmaśālā has been an important Nepalese institution of all times, not merely of the later periods whose building still happen to be intact. The frequent association of late Malla period dharmaśālās with ancient fountains suggests that many of the extant dharmaśālās represent pious replacements of ruined structures, originally joint gifts with the fountains. A pātī ruin on the road to Cāpāgāũ village, for example, is at best a century or two old, but its adjacent fountain predates A.D. 1472, the date of repairs recorded in an inscription on the fountain. Similarly, the eighteenth-century Sundhārā-sattal almost certainly represents the last of a succession of dharmaśālās that rose and fell beside the fountain, perhaps once a source for Licchavi Mātiṅgrāma. Despite its antiquity in Nepal, the dharmaśālā in Its various forms and functions was neither oflocal inspiration nor did it originate with the Licchavis. It is rooted in the ancient institutions of lndia, and perhaps ultimately the Near East. Of its Indian derivation, the vāstu-śāstras, or architectural treatises, provide ample testimony. We find in the śāstras, for example, as definite regulations concerning the construction of the dharmaśālā as those governing the lofty temple. For example, the roadside shelter, the mārgaśālā, "shall generally be built for every krośa [a measure of about two miles] ... The rest house may be a pillared hall with walled enclosures, platforms for taking rest and cooking rooms . . . Ponds and wells, cart stands and sheds for bulls, horses and elephants ... shall be arranged." 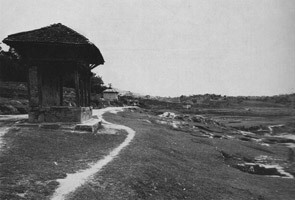 And while the simple Nepalese roadside pātī is a far cry, to be sure, from the elaborate mārgaśālā the vāstu-śāstra recommends, in its essentials it is no less than the same "pillared hall with ... platforms for taking rest [and] ponds and wells ... arranged." Similarly, the Nepalese village sorah khuṭṭā and city maṇḍapa sattal are the simple Himalayan counterparts of Indian maṇḍapa and sabhā, which like the mārgaśālā, are demonstrably ancient Indian institutions. The primitive Indian maṇḍapa, a square or rectangular pillared hall, was at first a separate structure associated with, but not attached to, the temple as it was to become in later times. It then served the same multiple purposes as its rustic Himalayan descendant. Like the latter, the early Indian maṇḍapa was both a rest house and a place of congregation for transient and local residents alike, a concert hall and a stage, and a hall for teaching, preaching, and learning. It was also a court of justice and a coronation site. The sabhā, structurally and functionally related to the maṇḍapa, and perhaps its progenitor, was the assembly hall and council chamber of the palace, even in Vedic India. For its construction the śāstras recommend the "abundant use of pillars ... [to] make them look like pillared halls with corridors and galleries all around supported by separate pillars." And here, a royal sabhā, is the primitive Kāṣṭhamaṇḍapa defined. Similarly, Maṇimaṇḍapa, the Patan royal council hall, unimposing and rustic to be sure, is nonetheless also a pillared sabhā - and so named in an inscription within - in form and function the same as its more resplendent forerunners. Like other dharmaśālās, Kāṣṭhamaṇḍapa and Maṇimaṇḍapa replace, one suspects, a continuum of more ancient structures. For Maṇimaṇḍapa, one of these might have been the sabhā of the fractious Patan nobles whose palace, Vanthunihman, stood nearby. And earlier still, perhaps, it was the site of a Licchavi sabhā joined to the ancient fountain in the center of the then Yūpagrāma. If so, the Licchavi sabhā, we may be sure, traced its own inspiration to antecedent Indian structures. Among these, of course, was the Maurya pillared hall of Pāṭaliputra, itself rooted in the columned Achaemenid structures of Susa and Ecbatana. Fig. 42The study of the rather simple architectural form represented by the Nepalese dharmaśālā has a value beyond mere illumination of an overlooked architectural type or beyond recounting the specific histories of one or two old buildings. The dharmaśālā has a particular pertinence with reference to the Newar style temple and its genesis. Analysis of the dharmaśālā, together with all the representative forms of Newar style architecture, reveals a fundamental unity. The temple, as merely the most prestigious unit, must then be studied within this broader framework, rather than as an isolated form. 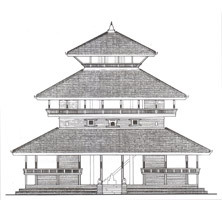 To illustrate, it is evident that certain Newar style temples are architecturally intimately related to the dharmaśālā beyond the general unifying interrelationship of techniques and materials. The very popular Mother Goddesses are commonly worshiped in an iconic form (usually stones) in a simple shrine open to the skies. The open shrine, no doubt the primitive norm, is perpetuated even when the deity is endowed with the sophistication of a temple structure. And in these instances the sanctum sanctorum is frequently architecturally nothing more or less than the common pāṭī supplemented with expected temple features (Fig. 42). This and similar comparisons, manifestly beyond the purview of this paper, must be understood before we can come to terms with the Newar style temple. Study of the dharmaśālā has a particular bearing on the contentious issue of the temple's genesis, local or foreign. Now, certainly, there is no correspondence of Indian temples with those in Newar style. Yet as recently as A.D. 1793 the similarity of the architecturally closely related dharmaśālā types of the two countries moved Colonel Kirkpatrick to observe that the Nepalese wooden buildings "appear to differ nothing in their figure or construction from the wooden Mundubs occasionally met with in other [sic] parts of lndia. If, as we believe, the Newar style temple and the dharmaśālā are architecturally one, and given the immediate Indian source of the dharmaśālā, it seems unlikely that for the temple alone the current of influence was reversed. Thus, while the ultimate origin of the temple may not be India, the testimony on the related dharmaśālā suggests that it was not Nepal. Proportionately as the modest dharmaśālā clarifies this issue, so does it illumine the history of the art of building in a wider Asian context. After receiving a doctorate in anthropology from Columbia University in New York City, Mary Slusser spent many years living and working abroad. She has spent a significant amount of time exploring the region of the Himalayas, including seven years in Nepal. In addition to Nepal Mandala: A Cultural Study of the Kathmandu Valley (1982) and her most recent publication, The Antiquity of Nepalese Woodcarving (2010), Mary's numerous writings include groundbreaking work on Nepalese metalcraft and stone sculptures. Gautamavajra Vajrācārya is a Sanskritist and scholar specializing in the art and culture of South Asia. As a young Newar scholar in Kathmandu, he assisted Mary Slusser when she was writing Nepal Mandala. He received a prestigious Rockefeller grant to work as a trainee at the Los Angeles County Museum of Art with Pratapaditya Pal, PhD, Senior Curator of Indian and Southeast Asian Art, on the first exhibitions of Nepalese art. Vajrācārya later earned a Master of Art degree in Art History from the Claremont Graduate School, California, and a PhD in South Asian language and culture from the University of Wisconsin, Madison. He has taught Indian art and culture at the University of Wisconsin for more than two decades. Among his most recent publications is the book Frog Hymns and Rain Babies: Monsoon Culture and the Art of Ancient South Asia. He is guest curator for the exhibition Nepalese Seasons: Rain and Ritual opening on May 6, 2016 at the Rubin Museum and author of the related catalogue of the same title. 1. The research which made this paper possible was financed by a generous grant from The JDR 3rd Fund, New York. To the Director, Porter A. McCray, and the Trustees of the Fund the authors take pleasure in acknowledging their gratitude. Dr. Pratapaditya Pal, Los Angeles County Museum of Art, with his usual goodwill has kindly critically reviewed the text, for which the authors are very grateful. All of the architectural drawings were made by Mr. Wolfgang Korn from field analyses of existing structures in the Kathmandu Valley. Mr. Korn worked especially diligently in assisting the authors' physical survey of the Dattātreya and the Lakṣmī-Nārāyaṇa structures and particularly in preparing the drawings of the lndra-sattal in Khãdpu. Certain of Mr. Korn's suggestions respecting the architecture of these buildings have been gratefully incorporated in the text. Mr. Madan Singh Tamrakar deserves special thanks as a constant field companion and assistant who made many contributions to the paper, not only as skilled architectural draftsman, but as a sensitive witness to Newar culture. Mr. Vajrācārya has ferreted out and translated all of the complex Sanskrit and Newari records upon which the historical interpretation of the study depends. The photographs were taken by Dr. Slusser who is also responsible for the written text. 2. It will be understood that throughout the paper we are referring only to the practices of the Kathmandu Valley together with its nearby areas. The dharmaśālās and commercial inns of the lowland Tarai and the surrounding mountains, structurally, and in part functionally, unrelated, are, of course, beyond our purview. We use the present tense in describing the dharmaśālās of the Kathmandu Valley because, the declining tradition notwithstanding, they are still a functional institution. Despite mushrooming hotels and the swarming Datsuns of Kathmandu city, most Nepalese still frequent the timeworn paths, afoot like their ancestors and like them, too, still bearing their own burdens. Their orientation is to the traditional cultural patterns in which the dharmaśālās, in their various ways, play a continuing role. 3. This is the so-called "Ṭhākuri" period, shadowy centuries of political anarchy which until they are better known will be best to leave unlabeled, referring to them, as many Nepalese historians now do, simply as the post-Licchavi period. 4. The Malla kingdom was not sundered by Yakṣa Malla's "baneful division" of it among his sons, a common but erroneous interpretation of Nepalese history (shared, for example, by Luciano Petech, Medieval History of Nepal, Serie Orientale Roma, vol. 10, Materials for the Study of Nepalese History and Culture, no. 3 [Rome: lstituto italiano per il Medio ed Estremo Oriente, 1958], p. 168). Joint rule was a common practice even during the Licchavi period and as joint rulers the Malla king's sons inherited the kingdom intact. Dissolution of the kingdom only began after the father's death in 1482 and was not a fact until Ratna, the most restless son, appropriated Kathmandu to his personal rule in 1484 (see Dhanavajra Vajrācārya ed., Itihāsa-saṃśodhanako pramāṇa-prameya. Pahilo bhāga [The proof of corrected errors of history, pt. l] (Patan: Jagadambā prakaśana, V.S. 2019 , main pt., pp. 133-134 [hereinafter cited as lSPP]). 5. Pṛthvī Nārāyaṇa, the first Śāha ruler of the Valley and of Nepal, considered the "three-citied Nepal a cold stone," deeming no good could come of dwelling where people "drink water from wells," but died before he could realize his dream of building a new capital high on the Valley rim (Nayarāja Panta et al., Śrī pānca Pṛthvīnārāyaṇa Śāhako upadeśa [The counsel of His Majesty Pṛthvī Nārāyaṇa Śāha] (Patan: Jagadambā prakaśana, Y.S. 2025 Pausa ), p. 323). 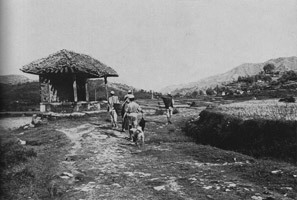 The common immigrants from the hills eschewed the Newar villages altogether, preferring to perpetuate their own ancestral-type hamlets composed of individual cottages scattered among their fields. Both kinds of villages, Newar and Parvatiyā, typify the present settlement pattern of the Kathmandu Valley. 6. From which we exclude the śikhara temples, an altogether different architectural tradition of well-established Indian origin. 7. A practical label for these traditional buildings still has to be coined. "Pagoda style" is a poor but well-entrenched tenn which, with its specific connotation of Asian tiered-roof temples, excludes not only single-roof temples but all other stylistically related buildings. Admittedly, "Newar style" is little better, for although it identifies the practitioners of this way of building in Nepal, it obscures its primitive antecedents. These, by no means established, are almost certainly not of local inspiration. 8. There is another type of traditional Newar community building, the capāṭa (capāḍa, capāra, capāla) which duplicates many uses to which the dharmaśālā is put by neighborhood communities. But strictly speaking this is not a public rest house and therefore outside the domain of the present discussion. The name capāṭa and its alternates, however, is often equally applied to various kinds of dharmaśālās. It may be derived from the Sanskrit caturpaṭṭa, caturpāṭṭikā, a "four-sided building." 9. An exception is the pāṭī-like porch built into private houses which often serves the owner as a shop. 10. One of the Newari names, phale or phalacā (which means platform, the basic element of this or any dharmaśālā), is perhaps more appropriate to designate the common Newar style shelter than the Nepali word, pāṭī. But pāṭī denotes any inn, charitable or commercial, everywhere in Nepal and is the most commonly employed term for these simple Valley shelters as well. A Newar speaking his own tongue would call them phale or phalacā; speaking Nepali or English, he would certainly employ the common Nepali name. Thus we have followed the usual practice and designate them by the Nepali name, pāṭī. 11. 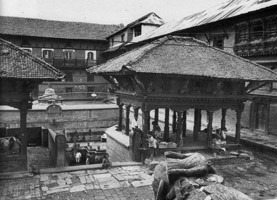 A decaying pāṭī of hexagonal shape, perhaps unique, stands opposite the main Bhīmasena temple of Kathmandu. 12. Legendarily considered to be the oldest fountain in Patan, its Licchavi date, at least, is suggested by the discovery of an inscription within, normally under water, dated Saṃvat 492 [A.D. 570]. Although there is no specific mention of the fountain in the inscription (contrary to the published English summary) it is probable that the trust of lands which the inscription records did concern the foundation or one of its carved stone spouts (Hemarāja Śākya, Abhilekha-prakāśa [Discovered inscriptions] [Patan: Karuṇā prakāśana, 1969] inscr. 3, pp. 5-6). 13. Mahīndrasiṃha (=Bhāskara) Malla, ruler of Kathmandu, and of Patan for a time, received the Patan crown in Maṇimaṇḍapa in A.D. 1722 (D. R. Regmi, Medieval Nepal, 4 pts. [Calcutta: Firma K. L. Mukhopadhyay, 1965-1966; Patna: self-published, 1966], pt. 3, app. 4, p. 128). 14. Rāmajī Tevārī, et al., eds., "Manigalabajāra Maṇimaṇḍapako abhilekha [The Maṇimaṇḍapa inscription of Maṅgal Bazaar]," Abhilekha-saṅgraha pt. 6 (Kathmandu, V.S. 2019 Śrāvaṇa [June 1962]), pp. 21-22. 15. In actual practice the Nepalese maṭha is difficult to distinguish institutionally from the sattal. But architecturally it is quite distinct and corresponds more closely to the Buddhist vihāra. A number of the maṭha buildings still stand in the Kathmandu Valley (thirteen in Bhaktapur, six in Patan, and one or two in Kathmandu), but only a few still function as monasteries. The rest, like the decaying vihāras, too, are falling into ruin or still shabbily house descendant families of former inmates. An exception is the principal Bhaktapur maṭha, the Monastery of the Priests (Pūjāri-maṭha) (Fig. 41), now totally restored by His Majesty's Government in cooperation with the Federal Republic of Germany. 16. Now a rather uncommon practice, but it can still happen. An Indian ascetic, installed in a dharmaśālā beside a famous Nepalese temple, once affirmed that he had resided there three years and expected to stay another nine. This was to witness the brief, twelve-year cyclical welling forth of a magic lake, now covered by the temple. 17. As recorded in a stone inscription fixed inside the ground floor shrine and recently published by Hemaraj Sakya and T. R. Vaidya, Medieval Nepal: Colophons and Inscriptions (Kathmandu: T. R. Vaidya, 1970), inscr. 53, pp. 189-192. 18. As recorded in an in situ inscription published by Regmi, Medieval Nepal, pt. 4, inscr. 109, p. 237. The fountain (but not the golden spout) may have originally supplied Mātiṅgrāma, a Licchavi settlement which with many others at length became Patan. The fountain's antiquity is suggested by the numerous architectural and decorative fragments of Licchavi date in and around it and by a Licchavi stone inscription which still stands beside it (Raniero Gnoli, Nepalese Inscriptions in Gupta Characters, Serie Orientale Roma, vol. 10, Materials for the Study of Nepalese History and Culture, no. 2, 2 pts. 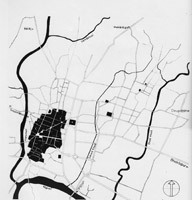 (Rome: lstituto Italiano per il Medio ed Estremo Oriente, 1956), pt. 1, inscr. 38, p. 53 (hereafter cited as Gnoli). In Patan the Sundhārā is the only one where water is obtained at ground level. Characteristically, this is explained by a wondrous legend, still heard in the bazaar and recorded in part by Daniel Wright, History of Nepal, 3rd ed. (Calcutta: Ranjan Gupta, 1966), p. 168. 19. The first date is provided by an unpublished ṭhyāsaphu, or daily journal, which records: "the fall of a thunderbolt on Ekhālaṃkhu-satara. In the evening of 783 Jyeṣṭha Kṛṣṇa budhavāra Edkhālaṃkhupura was struck by lightning [and two men] were killed." The restoration date is given in an unpublished inscription affixed to the building. 20. Panta et al., Śrī pānca Pṛthvīnārāyaṇa Śāhako upadeśa, p. 1063. 21. Regmi, Medieval Nepal, pt. 3, p. 6, fol. 14. 22. Exceptionally, despite the sattal's several shrines, the rooflacks the characteristic finial which, god-denoting, marks almost all religious structures. lndeed, their rare absence - the shrine of Aśoka Gaṇeśa, Kathmandu, or the temple of Vajravārāhī, Cāpāgāũ, for examples - is sufficiently unusual to invariably occasion a wondrous tale of explanation. 23. By Pratāpa Malla, ruler of Kathmandu A.D. 1641-1674. The dedicatory inscription is published in Saṃskṛta-sandeśa vol. I, no. 4 (Kathmandu, V.S. 2010 Śrāvaṇa [July 1953]), pp. 1-6. See also Wright, History of Nepal, p. 145 for the chronicle's account of the foundation. 24. Its closest competitors are the temple of Cāṅgu Nārāyaṇa and Indreśvara Mahādeva (Panautī village), respectively thirty-two and thirty square feet. Vasantapura, or the Nautale, the nine-storey pleasure pavilion of the Hanūmān Ḍhoka palace, built in Newar style at the command of the first Gorkhāli king in A.D. 1770, is much taller than Kāṣṭhamaṇḍapa but less than thirty feet at its widest (cf. Fig. 25). 25. This is now blocked with a picket fence as a conservation measure of the Department of Archeology, His Majesty's Government, which carried out a major restoration of the building in 1966 (Rameśajanga Thāpā, "Kāṣṭhamaṇḍapa, Ancient Nepal no. 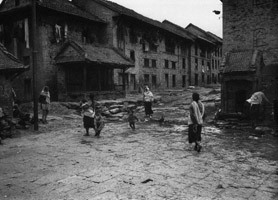 3 (Kathmandu, April 1968), pp. 33-39, in Nepali; pp. 41-43, English abstract). The small tiles of the floor date from this time, too, replacing older ones approximately a foot square. 26. The upper floors are now closed to the public but our entry was authorized by Mr. Ramesh Jang Thapa, Director of the Department of Archeology, His Majesty's Government, to whom we take pleasure in acknowledging our gratitude. Without Mr. Thapa's courteous cooperation our study of the upper floors would not have been possible. 27. Thāpā, "Kāṣṭhamaṇḍapa," pp. 33, 41. 28. The history of the city's growth from several Licchavi hamlets established at the favorable site at the junction of the two rivers is a complex historical problem which must be set aside for discussion elsewhere. 29. N.S. 263 Āśvina, ISPP, main pt., p. 110. 30.This may have been a relatively rapid process. The installation of a large image of Hanūmān at the Kathmandu Malla palace gate in A.D. 1673 quickly led to both gate and palace being dubbed "Hanūmān Ḍhoka," the Hanūmān Gate. The popular name eclipsed the previous name of the palace which we have yet to recover with certainty. 31. Sakya and Vaidya, Medieval Nepal, colophon 8, pp. 15-16. 32. ISPP, main pt., pp. 110-111. 33. Bāburāma Ācārya, "Kāṭhmāḍaũ," Pragati vol. 1, no. 2 (Patan, V.S. 2010 [1953)), pp. 26-27; Yogī Naraharinātha, "Kāṣṭhamaṇḍapa," Saṃskṛta-sandeśa vol. 1, no. 6 (V .S. 2010 [September 1953]), pp. 4-10; ISSP, main pt., pp. 110-115; Thāpā, "Kāṣṭhamaṇḍapa," pp. 37-38. 34. Evidence for a still earlier date may be at hand. Our Kāṣṭhamaṇḍapa research revealed a manuscript copy of the Aṣṭasāhasrikā-Prajñapāramitā in possession of a gūṭhī, or trust association, which is closely associated with the sattal and within whose precincts the association performs an annual ceremony. Gūṭhī members claim that the manuscript contains the history of the sattal, its foundation and subsequent renovations. Unfortunately, as a jealously guarded sacred relic, the manuscript beyond a brief perusal has not yet been made available for study, and it has not been possible to verify the gūṭhīars' assertions. That it is an early manuscript there is no doubt, for the colophon records that it was completed in N.S. 210 Phālguna (A.D. 1090) in the reign of King Harṣadeva (ruled ca. 1085-1099). 35. Regmi, Medieval Nepal, pt. 3, app. A, inscr. 27, pp. 18-19. 36. Wright, History of Nepal, p. 143; Bikrama Jit Hasrat, History of Nepal as Told by Its Own and Contemporary Chroniclers (Hoshiarpur, Punjab: V.V. Research Institute Book Agency, 1970), p. 73 (hereafter cited as History of Nepal). 37. Hasrat, History of Nepal, p. 73. 38. Henry Ambrose Oldfield, Sketches from Nepal, 2 vols. (London: W. H. Allen, 1880), vol. 1, p. 103; Perceval Landon, Nepal, 2 vols. (London: Constable and Co., 1928), vol. 1 p. 43; David Snellgrove, "Shrines and Temples of Nepal," Arts Asiatiques vol. 8, no. 1 (Paris, 1961 ), p. 106. 39. Ācārya, "Kāṭhmāḍaũ," and Naraharinātha, "Kāṣṭhamaṇḍapa." 40. ISPP, main pt., pp. 110-115. 42. Wright, History of Nepal, p. 143; Hasrat, History of Nepal, p. 73. 43. A "biseta" (viseta) according to the chronicle, i.e., a temple servant as these persons were once known. 44. The popular Newari name of the vihāra, Sikhamu, means wood (sĩ) and knots (khon). Although the sattal is now called Siṃha-sattal for the gilt lions added to it in the nineteenth century, the original name was Sĩlya, a name meaning "excess wood." 45. Ācārya, "Kāṭhmāḍaũ," pp. 27-28; Naraharinātha, "Kāṣṭhamaṇḍapa," pp. 2-3. 46. Ācārya, "Kāṭhmāḍaũ," pp. 27. That the building should be built over a pond is in keeping with a recurrent motif in Nepalese legend in which many temples, and more particularly the stūpas, are believed to be built over ponds or fountains. 47. Thāpā, "Kāṣṭhamaṇḍapa," p. 39. 48. Medieval Nepal, pt. 1, p. 558. 49. Nayanātha Pauḍela and Devīpraśāda Laṃśāla, eds., Bhāṣāvaṃśāvalī [Nepali language chronicle], 2 pts. (Kathmandu: Nepāl Rāṣṭriya Pustakālaya, V.S. 2020-2023 [1963-1966], pt. 2, pp. 18-19 identifies the city, and an inscription at Paśupatinātha refers to the paṭṭamaṇḍapa therein, Saṃskṛta-sandeśa vol. I, nos. I 0-12, p. 46, line 18. 50. As previously cited, Regmi, Medieval Nepal, pt. 3, app. A., inscr. 27, pp. 18-19. 51. Gnoli, inscr. 52, p. 69. 52. There is no indication that the sattal was "dedicated to the Buddha," as the English summary states in Rameśajaṅga Thāpā, "Kāṣṭhamaṇḍapa," p. 41. This is a misinterpretation of the cited colophon which does not mention the sattal, but the city. The error does not occur in the author's original Nepali language contribution, p. 33. 53. As brought to our attention by Dr. Pratapaditya Pal (Shasibhusan Dasgupta, Obscure Religious Cults, 2nd. ed. [Calcutta: Firma K. L. Mukhopadhyay, 1962], pp. 7, 386). 54. Dasgupta, op. cit., p. 7. 55. Hasrat, History of Nepal, p. 73. 56. Samuel Beal, Si-yu-ki. Buddhist Records of the Western World. 2 vols. (1884: reprint ed., Delhi: Oriental Books Reprint Corp., 1969), vol. I, p. 55 and n. 197, p. 76. 57. Gnoli, inscr. 59, p. 79; Regmi, Medieval Nepal, pt. 1, p. 599. 58. The Kusale rank higher than some outcastes in the traditional social hierarchy but their standing is very low indeed, despite Nepalese law which now forbids this discrimination of caste. They are considered "pāni na cālne, " that is unfit persons from whom to receive drinking water. 59. Gopal Singh Nepali, The Newars (Bombay: United Asia Publications, 1965), pp. 135-145 passim. 60. Saṃskṛta-sandeśa vol. 1, no. 6, pp. 5-6. The published transcription is too faulty to permit a full understanding of the text. We have been unable to rectify it yet because of the difficulty of reading the original, a blackened and warped plaque nailed high overhead in an almost inaccessible place on the beams. 61. Regmi, Medieval Nepal, pt. 3, app. A, inscr. 71, pp. 79-80. 62. Dhanavajra Vajrācārya, "Licchavikālakā śāsanasambandhī pāribhāṣika śabdako vyākhyā [An explanation of administrative terminology of the Licchavi period]," Pūrṇimā vol. 3, no. 2, issue 10 (Kathmandu, V.S. 2023 Śrāvaṇa [July 1965]), pp. 12-13. 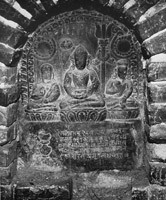 Certain aspects of the Nātha Gosāinkuṇḍa pilgrimage are discussed by Mary Slusser and Gautamavajra Vajrācārya, "Some Nepalese Stone Sculptures: A Reappraisal Within Their Cultural and Historical Context," Artibus Asiae vol. 35, nos.1-2 (1973), pp. 119-124. 64. History of Nepal, p. 73, n. 1. 65. Thāpā, "Kāṣṭhamaṇḍapa," pp. 35, 43. 66. The Nāthas installed in the maṭha adjacent to Hanūmān Ḍhoka, however, claim that they worship an image, rather than the pādukā, of Gorakṣanātha. If so it may well be of Śāha date. 67. Sakya and Vaidya, Medieval Nepal, inscr. 21, pp. 100-101. Gorakṣanātha is also the tutelary deity of Gorkhā, town, former kingdom, and seat of the Śāha dynasty, some forty miles west of the Valley. The town bears the deity's name and is the location of his famous cave shrine. 68. Sylvain Lévi, Le Népal: Étude Historique d'un Royaume Hindou, 3 vols. (Paris: Ernst Leroux, 1905-1908), vol 1, pp. 347 to 357 gives a full account of the tangled relations of these two Nāthas as observed from the differing viewpoints of Hindu and Buddhist, and briefly discusses their possible antiquity. Relevant material respecting these enigmatic members of the complex Nepalese pantheon may be consulted in David Snellgrove, Buddhist Himālaya (London: Bruno Cassirer, 1957), pp. 116-118; Petech, Mediaeval Nepal, p. 30; Gopal Singh Nepali, The Newars, pp. 317-321; and G. W. Briggs, Gorakhanatha and the Kānphatta Yogis (Calcutta: Oxford University Press, 1938), p. 228ff. 69. Lévi, Le Népal, vol. 2, p. 238; Petech, Mediaeval History of Nepal, p. 167; Snellgrove, "Shrines and Temples of Nepal," p. 106; Pratapaditya Pal, Vaiṣṇava Iconology in Nepal (Calcutta: The Asiatic Society, 1970), p. 122. 70. 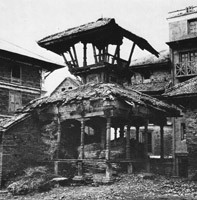 The failure to better integrate the supplementary porch with the earlier structure seems to be typical of the remodeling techniques of the Newar architect and may be seen in many other buildings in the Kathmandu Valley. In craftsmanship they were, of course, capable of creating a unified building but it seems simply not to have been a concern. 71. Wright, History of Nepal, pp. 128-129. 72. Yogī Naraharinātha, ed., Devamālā vaṃśāvalī [Wreath of gods chronicle] (Kathmandu: Yogapracārinī, V.S. 2023 , p. 77). 73. ISPP, main pt., p. 131 documents Rāja's death previous to N.S. 588 Kārtika . 74. As ascertained from an unpublished inscription dated N.S. 883 Vaiśākha (A.D. 1763) affixed to the nearby Pūjāri-maṭha. 75. Bholānātha Pauḍela, "Yakṣeśvara-mandira [The Yakṣeśvara temple]," Pūrṇimā vol. 2, no. 1, issue 5 (V.S. 2022 Vaiśākha [April 1965]), pp. 16-21, shows that despite lack of inscriptional proof the temple may be assigned with certainty to Yakṣa Malla although the earliest known date associated with it is A.D. 1487 [N.S. 607 Āṣāḍha], at which time Yakṣa's widow endowed the pre-existing temple in honor of her deceased consort. 76. Wright, History of Nepal, p. 129. 77. According to the Garuḍa stambha inscription. 78. Indreśvara Mahādeva of Panautī village may be another early exception, a question of dating to be discussed elsewhere. The eleventh-twelfth century date proposed for a small temple in Patan by Shirley M. Black, "A Medieval Nepalese Temple of Viṣṇu-Nārāyaṇa," Oriental Art, vol. 18, no. 2 (Summer 1972), pp. 163-165, is incorrect as I have discussed in "The Saugal-ṭol Temple: Further Notes on the Shrine and Its Sculpture," in press. 79. Gnoli, inscr. 62, line 15, inscr. 83, lines 54-55, "Leleko śilālekha [A stone inscription from Lele]," Abhilekha-saṅgraha pt. I (V.S. 2018 Vaiśākha [April 1961]), p. 30, line 7, Gnoli, inscr. 34, line 20. 80. "Valaṭolako abhilekha [An inscription from Val-ṭol]," Abhilekha-saṅgraha pt. 2 (V.S. 2018 Śrāvaṇa [July 1961]), p. 13. 81. Gopālarāja-vaṃśāvalī. fols. 25b, 27b (Regmi, Medieval Nepal, pt. 3, app. B, pp. 121, 123). 82. N.S. 592 Jyeṣṭha, Regmi, Medieval Nepal, pt. 3, app. A., inscr. 74, p. 85. 83. D. N. Shukla, Hindu Science of Architecture, Vāstu-śāstra, vol. I, Bhāratiyā vāstu-śāstra series, vol. 8 (Lucknow: Vāstu-vaṅmaya-prakāśanaśālā, 1960), p. 391. 84. Percy Brown, Indian Architecture: Buddhist and Hindu Periods, 5th ed. (Bombay: D. B. Taraporevala Sons, 1965), p. 62; Shukla, Hindu Science of Architecture, pp. 262-465. 85. Shukla, Hindu Science of Architecture, p. 367. 87. Tevārī et al., "Maṅgalabajāra Maṇimaṇḍapa abhilekha, Abhilekha-śaṅgraha 6, p. 21, line 4. 88. Rāmajī Tevārī et al., eds., "Bhaṇḍarakhālako yeṃkalivarmāko abhilekha [The Yaṃkalivarmā inscription of the Bhaṇḍarakhāla]," Abhilekha-saṅgraha pt. 10 (V.S. 2020 Śrāvaṇa [July 1963]), p. 3. 89. Dhanavajra Vajrācārya, "Licchavikālika bastī [Settlements of Licchavi times]," Pūrṇimā vol. 5, no. 2, issue 18 (V .S. 2025 Śrāvaṇa [Summer 1968]). pp. 91-93. The probable antecedents of Kāṣṭhamaṇḍapa, more complex and for Nepalese history indeed startling, will be discussed in a separate paper. 90. Colonel Kirkpatrick, An Account of the Kingdom of Nepaul (1811: reprint ed., New Delhi: Mañjuśrī Publishing House, 1969), p. 159. 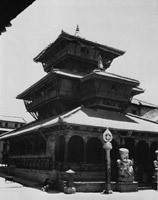 Although Kirkpatrick termed the Nepalese buildings "wooden temples" his continuing remarks make clear that he refers to the dharmaśālā: "Beside these [wooden temples], Khâtmândû contains several other temples on a large scale, and constructed of brick, with two, three, and four sloping roofs, diminishing gradually as they ascend ... "